Legal History Blog: Balleisen et al. 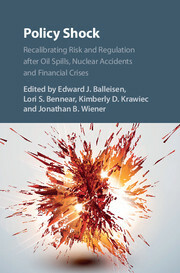 's "Policy Shock"
Just out from Cambridge University Press is Policy Shock: Recalibrating Risk and Regulation after Oil Spills, Nuclear Accidents, and Financial Crises, co-edited by four Duke University scholars, Edward Balleisen, Lori S. Bennear, Kimberly D. Krawiec, and Jonathan B. Wiener. Policy Shock examines how policy-makers in industrialized democracies respond to major crises. After the immediate challenges of disaster management, crises often reveal new evidence or frame new normative perspectives that drive reforms designed to prevent future events of a similar magnitude. Such responses vary widely - from cosmetically masking inaction, to creating stronger incentive systems, requiring greater transparency, reorganizing government institutions and tightening regulatory standards. This book situates post-crisis regulatory policy-making through a set of conceptual essays written by leading scholars from economics, psychology and political science, which probe the latest thinking about risk analysis, risk perceptions, focusing events and narrative politics. It then presents ten historically-rich case studies that engage with crisis events in three policy domains: offshore oil, nuclear power and finance. It considers how governments can prepare to learn from crisis events - by creating standing expert investigative agencies to identify crisis causes and frame policy recommendations. The code for a discounted purchase price is here.